People leave all sorts of strange things inside books, sometimes for safekeeping and sometimes for want of a proper bookmark. The practice is so common, in fact, that there are several websites dedicated to the astounding array of ephemera found in second-hand books around the world (try Found in Books, Forgotten Bookmarks and Things in Books for starters). Library books are no different – one needn’t look far to find tales of books returned with bacon in them. Fortunately we don’t have any of those horror stories in the College library, but we do occasionally find unusual items in our books while adding them to the online catalogue. Our discoveries are usually quite popular on Twitter, so we decided to make them the subject of out latest online exhibition. We’ve gathered together advertisements, photographs, postcards and various other odds and ends to show you a different side to our books and the people who use them. Visit the Exhibitions page on our website to find out more. 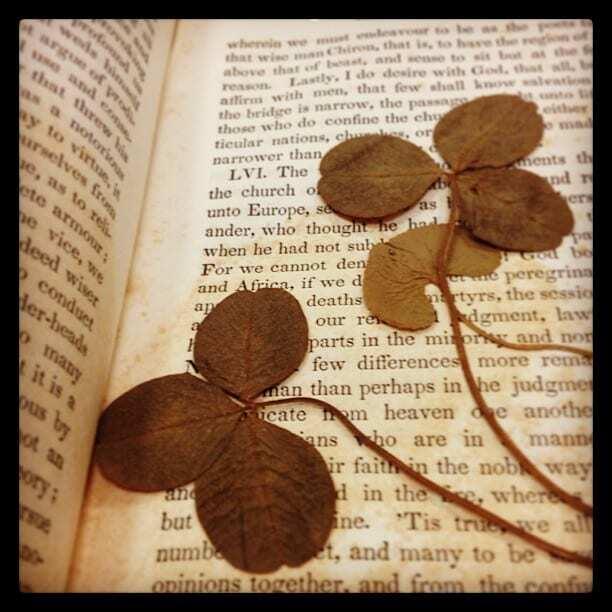 Some leaves found inside Sir Thomas Browne’s “Religio Medici”. Visit our online exhibition for more like this.